Parallel or in series ? If you have a mppt controller go series, from the photo’s it looks like you have covered the edge strips of the panel? Yep, covered few mm on the sides. Got Victron 100/50 MPPT. Series it is. What about the fuse? Should I install one? 3 panels in series 23volt each makes max voltage is 69volt. Amperage stays the same 12 amps I guess. So about 20amp fuse than? If all will have same sun the series if one ir more can differ parallel. Also does the panels have frame ? Or directly attached to the bimini ? If directly they will not last long unfortunatly as tbe canvas flex all the time and this breacks the panels. The Victron unit has a fuse on the output and is protected so in my view, no fuse required. Also, maximum voltage on input side is 100 volts so series is fine. 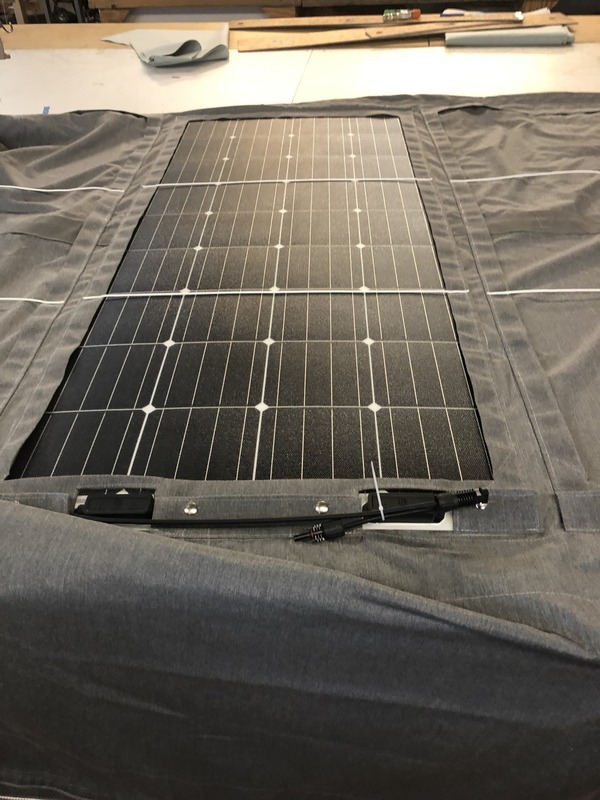 interestingly, series or parallel may be ok but if your cables from the solar panels to the controller are thin, series would provide less energy loss in the cabling as less current will flow for a given power rating. 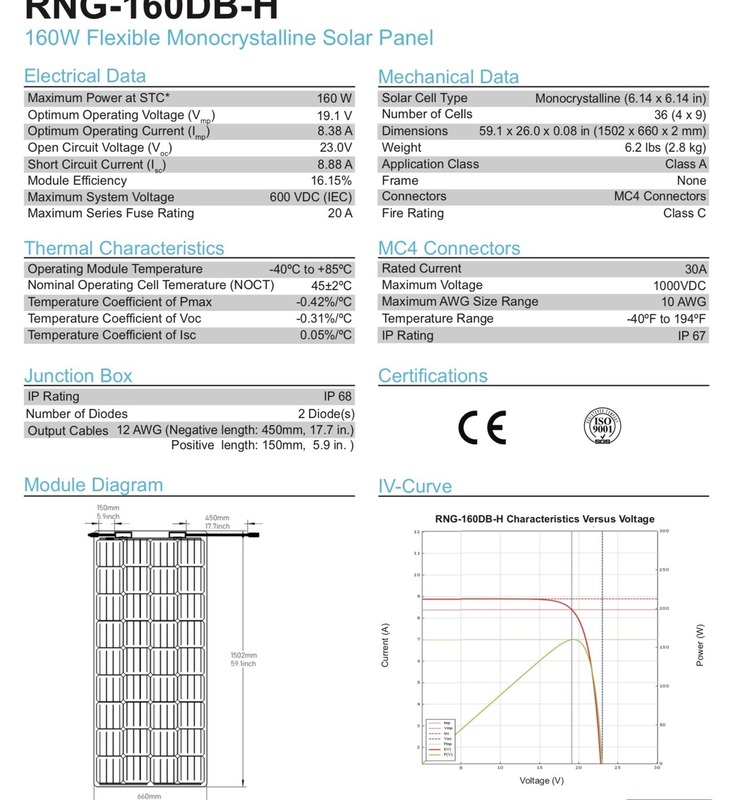 If the cables between solar panels and controller are thick (low resistance) the power loss may be negligible in either configuration. Nice job by the way with the sewing. That is actually quite a big job I think, but just another point maybe worth mentioning. The couple of strips that go across the panel to presumably secure the panel may cause you some grief. I am not sure exactly what type of panels these are but some panels suffer terribly from a line of shade across them. It is possible that the provision of that very thin strip in a couple of locations on each panel may cause you some serious degradation of efficiency. Try it out and see but you may have to think that through if the panels do not meet your expectations. Directly attached to the bimini, few mm are covered by the flops around the panels, but it’s 160wt x 3 should be sufficient. Just got off the phone with Justin at Victron. For my setup 3 panels 160Watt, 480Watt total. 10Amp circuit breaker between Panels and Controller to make sure panels can be disconnected and that value is derived from Isc=8.88Amp. When panel is on shade it still produce the same voltage but the amps and minimal . E.g if the is a parcial shading and in series all the panels will produce the same as lowest producing panel. If there is no chance if parcial shading( e.g all panels always has same exposure to the sun - then serries is better as mppt controllers works a bit better with higher voltage. I don’t know, I was very specific about the boom over the panels and partial shading. Guys at Victron still told me series is the way to go. Completely agree with Vasco . 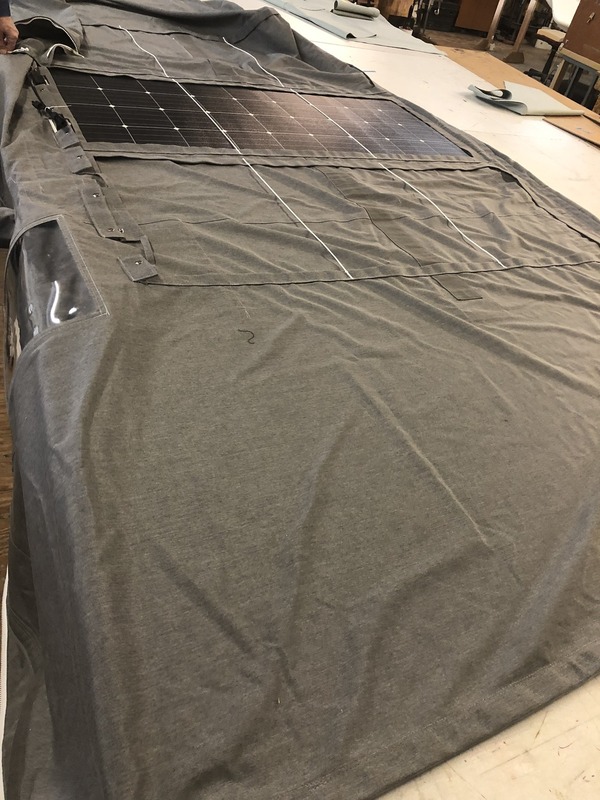 Sorry for the negative post , but I will give these panels 2 to max 3 years lifespan and then you start loosing capacity due to microscopic cracks that will occur because of the constant flexing of the bimini and most likely also because temperature ups and downs , they become very hot , no ventilation under the panels and the canvas acts as an insulation . In the beginning I thought it was the soldered joints that gave away , now I know it's the cells that rupture . In the board's history you can find my stories and explanation on the fragility of these flexible panels . Unless you back them up with a sheet of plywood or aluminum you will soon be replacing them by rigid panels as I did last year . Flexible panels are meant to be positioned in the desired curve and then be left like that. Most of them are not built to take/flex every wave and roll the boat takes . I was so proud of my new setup 4 years ago ( see picture ) , close to 30 amp/hour between 11:00 Am and 15:00 Pm Med. summer sun. 2 years later it had gone down to nearly half of that , the third year 1/3 of the first summer capacity was the next target .It was time to trow in the towel , I made an S/S frame ( an aluminum will also do ) on top of the bimini's frame and my rigid panels feel right at home. You will surprised how much energy is lost because of the covered edges. Would address that if possible . I think your setup is beautiful. And I did consider hard setup but couldn't get any one to show me how to build frame properly. Is there any way you could post more pictures of how your frame is setup? Hold on , the picture is the previous setup with the flex panels . I see you made pockets for the panels but the edges are overlapped which is not good . As you can see my previous fix was done by plastic tenax fittings true/on the bimini itself , easy to install and easy to take away for winter berthing , no summer storm was able to blow them off btw . I always get my bimini down in the winter . Unfortunately I have no specific pics of my rigid panel setup ,never bothered to record the progress . Maybe you get an idea how I tackled it with a picture ( the second one ) I've taken whilst being on the hard last May . The third one is a zoom-in to illustrate, kindish , how the bimini frame was used to make the bridge/frame that holds the panels . Upcoming May a bridge-support between the 2 ridged panels is scheduled to put on the only flexible panel that is still (nearly) 100% function able . That will be position in front of the back stay and thus add an 80 watt extra . The collective output of the 2 rigids ( they individually have a higher output than a flex panel) and the 1 flex will then come close to the output I had with the flex setup when it was new . So that additional flex panel will rest on 2 supports lengthwise and that would mean it could still move (due to wind , waves) width wise and sooner than later microscopically crack . Therefor some extra supports in the width must come in place so I can sicaflex glue the middle area of the flex on it , no movement possible . As for the rigid panels mount , my wife and I made our new bimini our self last year so is was fairly easy to make the holes in the canvas in the right places for the bimini plastic jaw fittings that on their turn hold the bridges/frame on which the rigid panels are fixed . See first pic of the type of jaw fittings I've used for that primary fix. That also makes it reasonably straight forward to take our panels ( and bimini ) off before the winter. Thank you, looks like there is a lot involved into building that frame. I was actually trying to see if new frame could be built and attached on top of the existing bimini frame. I will let you know how these panels performing. For my last boat I had a frame built and bolted to the bimini before laying a solid panel on top. Remember to make bolt holes on bimini struts slightly oversized (oval) to allow for adjustment as bimini stretches over time i.e. you don't want the solar panel bracket to prevent the bimini bars moving apart slightly to keep bimini canvass taut as it ages. reluctant to do so in order not to weaken the frame too much. After all , adding 2 panels means 4 holes/frame tube , and since the bolts need to have some body/strength I would of gone for 8mm . On a 25mm tube that is 1/3 ( not taking the oval shape of the hole into the equation) of the material on 4 spots/frame tube . It just didn't feel comfortable for me , but since it worked for you - up to now that is - I guess I could of done it the same way . I also would not drill the tubes. I avoided drilling the Bimini frame by using the stainless steel tube fittings (Saint or similar). There is one for a Tee connection that wraps around the straight through tube and the screw is only in the fitting, so does not compromise strength. But if it is already drilled, well, don’t fix what ain’t broke. Unless you are preparing for a major ocean voyage. The other way I have done it is to use a fitting for attaching stuff to staunchions. Again it clamps around the tube, and enables bolting of attachments. Inexpensive and in any marine chandler catalogue. I bolted these to the solar panel frame, then mounted them on a core and aft tube connected to the frame by tee fittings. Strong, stable in all winds and easily adjusted. Sorry I don’t have any pictures, but I can take some next time I am at the boat, unfortunately that will be a week or two. I find it desirable to be able to tension the Bimini canvas a little. This means a panel frame with a sliding element, so the canvas can be tensioned with the frame bolts loose, then tighten the frame bolts. Also, after nine years experience with my frame, I have found it is better not to make a hole for an attachment, but a complete cut to the edge, with the ecessary bound edges and extra zips or whatever necessary to join it up so that you can remove the canvas for repairs or even just access for getting the tension adjusted. It saves an awful lot of unnecessary disassembly when the inevitable maintenance is required.